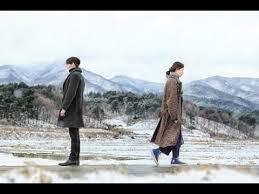 Korean television drama is part of the "Korean wave" that has swept across the world. This relatively small country of 51.2 million people has generated a revolution in fashion, music, television, and the movies, especially in Asian countries, but also in the US. I am a big Korean drama fan and have spent a lot of time thinking about what makes them so wonderful. It’s a little embarrassing to admit, but when it comes to my favorite genre beauty is its first and foremost concern. And by that I mean the physical beauty of the actors. The producers of Korean television dramas use beauty as a radical form of storytelling and that makes for a rather strange art. Uncontrollably Found is a perfect example of the genre and its obsession with beauty as a means of storytelling. The series was released in 2016 to great interest, maybe because the trailer gave you everything you needed to know. 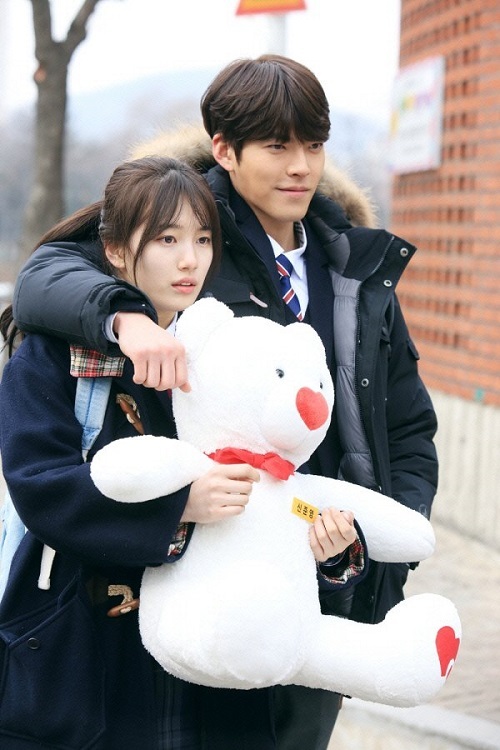 Kin Woo-bin and Bae Suzy, popular Korean actors, were the leads: and for my purposes, two especially beautiful people. I won't say that this drama has no plot at all, but the plot is entirely in service to the lead actors’ beauty. I have been watching Korean drama for many years and all the common themes are here: car accidents, family conflicts, poor girl vs. rich guy, and, the always popular, losing your memory. But what’s interesting is not the presence of clichés, but how the actor’s beauty transforms those clichés into something else entirely and fuels the logic of the story. There are many scenes in Uncontrollably Found that lets the audience know how good-looking the actors are. The lead character Noh Eul experiences three car accidents in the show—that’s a lot. I don’t know one person who had had two and so three’s a bit much. Of course, car accidents are dramatic in and of themselves, and the whole purpose of these accidents is to make you concentrate on the casts’ beauty. I want you to think about that for a moment. It’s not the car accident, but that the car accidents allow for a display of beauty. For instance, in the middle of this drama, Eul, purposely uses her car to hit someone she hates. Nonetheless the person who gets hurts is Eul, even though she is using her car as a weapon. The reason for this is obvious. She looks wonderful in an accident or least a television drama car accident. By no stretch of the imagination are these realistic car accidents. But in this case Eul looks so beautiful—the blood just dripping off the side of her forehead—that you only care about looking at her. The look of distress on her face makes her even better looking. The whole point is that this accident is not an accident, but a display of beauty. If you don't get what the Korean drama wants you to look at in the accident, then just wait until right after the accident. Her boyfriend Joon-young carries her bridal style into the hospital. I don't know about safety protocols after an accident, but I'm pretty sure carrying her in this romantic style isn't one of the right ways to treat the victim of a car accident. But it does make for a great shot. The camera can focus not only on their facial expressions, but also the dreamy style of their poses. What could be more dramatic, and more to the point, what could be more beautiful. Getting carried in this way allows for a perfect cheekbone to perfect cheekbone shot. 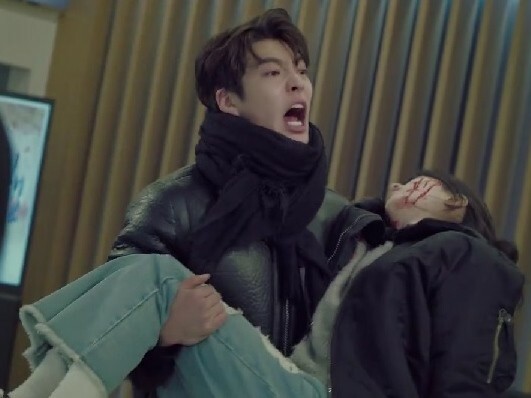 It’s obvious why he didn't call an ambulance, because catching Joon-young shouting "Someone please help her!" while carrying Eul into the hospital is a great shot. We can see both of their faces pressed together, like a beautiful photograph: one in a coma and the other suffering from extreme anxiety. If you’re following the logic of Korean television dramas, you might get used to seeing a guy carrying his girlfriend on a "bridal style" ride when she gets injured, but in reality the first thing to do is to is to stabilize her body and not pick her up. Someone help her! Please! We're so beautiful! The plot is about extenuating beauty and an accident does just that. The audience gets to concentrate on the actor's face and expressions—it’s a makeup artist’s dream. We are not only watching a beautiful woman being carried by a good-looking man into a hospital, but we are also watching their faces in unison. And that is pleasing. 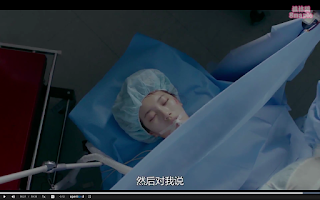 Also, hospitals have lots of beds, where good looking actresses like Bae Suzy can be beautifully placed, just like sleeping beauty. The director films her face while she is sleeping without any external disturbance (she’s perfectly composed surrounded by hospital green sheets). She looks even prettier passed out. It doesn't make sense to the plot, but it sure does if you care about beauty. The plot should be focusing on the surgery and the doctor trying to save her life, but what we really want to watch is her passive, unconscious, beautiful face. Anyway, just adding a scene in a hospital becomes a perfect stage for the actors to showcase their beauty. And apparently cars are good for more than accidents. Scenes where we watch a good-looking guy driving a car are especially popular. In the first episode, Joon-young is driving his car looking for Eul. This might be obvious to say, but he looks great driving the car, and, in fact, the camera catches him and lingers on the fact that he's driving long past any issues of continuity or context. Apparently, good-looking guys look good driving expensive cars, and when Joon-Yung finds Eul walking alone in an alley, which has beautiful grassland and mountains for background, the beauty quotient is off the charts. The weather suddenly becomes a beautiful snowy day, of course. It doesn't make any sense because it was a sunny day when Joon-young started looking for her, but suddenly it’s snowing hard at the moment when he finds Eul. Both of them look extremely beautiful walking in the snow, and the white snow makes their skin look incredible. It is obvious to say that in reality weather doesn’t change this fast. So, even the weather is part of the plot to bring out their beauty. 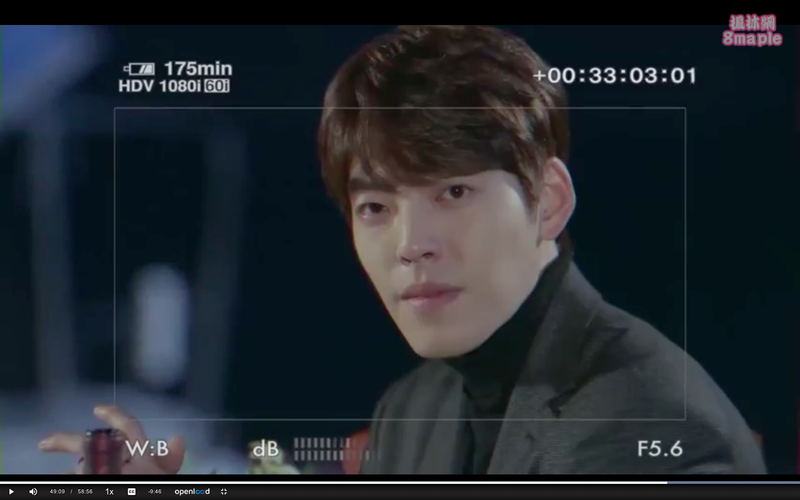 The scene is so pretty that it even pops off the screen of my laptop. The view and the actors plus the effects of the weather maximize the beauty of the scene, which is the goal of all Korean dramas. Another important plot point is Joon-young's occupation. In the drama, he is a famous singer and an actor. For that reason, many of his scenes are filmed as if he is a star we are watching on film. Everything is from a director’s point of view and so the choices about how to exploit Joon-young’s beauty are all the more obvious. And, ironically, Eul's job is a documentary director filming Joon-young's life. So, the audience is actually watching him from his girlfriend's point of view and so she naturally highlights his good looks. So whenever Joon-young wants to say something important to her, he usually says it while Eul is filming him. And the result is that we always see him at his most glamorous. Eul is not filming a journalistic expose, but one of those features on a star, the type that is supposed to make the subject seem fascinating and interesting and, well, beautiful. In some episodes, Eul is filming Joon-young in his beautiful house as he goes about his beautiful daily life. There are many scenes of him just doing nothing in his house. And to top it off there are art photographs of Joon-young hanging in his own room, not just one but at least five! So, wherever he is in his house, he’s always beautiful posed behind himself. For instance, even it is just a scene of Joon-young eating in the kitchen or cleaning his bedroom, there’s always a beautiful photograph behind him to remind us that no matter how mundane his actions, he is the subject and object of beauty. There are three 10-foot portraits in his bedroom alone; that's a lot! Everywhere the camera moves, we’re always looking at Joon-young as if he were a piece of art. No matter what happens, the producers never let us take our eyes off the leads. The drama actually covers a wide swatch of time, jumping from the present situation and all the way back to high school. Usually when that much time passes, the director will use a different but similar looking actor to convey the passing of time. But since the goal of Uncontrollably Found is to show off the beauty of its leads, they just put them in different costumes. Perhaps that says more about the concerns of Korean television drama than anything else: find two beautiful people and never take your eyes off them.